Yeah, I know it's not the prettiest omelette ever made, but I only wanted two eggs and I also didn't want to skimp on the veggies inside. Ripe organic tomato, mushrooms and a little sausage. Topped off with some New Zealand grass fed cheddar cheese. Even though I am eating high quality food, I still want to watch my portion sizes. And this is my favorite part of breakfast-because it's like a dessert to me; orange juice with gelatin, heavy cream and a little raw honey. Sticking with my protein, fat and carb at every meal I have two eggs fried in a little coconut oil. Coconut oil is a healthy fat! To read more on it I highly recommend this link for starters- http://www.hybridrastamama.com/2012/01/160-uses-for-coconut-oil.html ...A little bacon, strawberries with a tbs heavy cream on top, my little green bowl contains about 1/2 a cup of grass fed berry yogurt from Whole Foods and then 8oz orange juice with two 2Tbs heavy cream mixed together. A friend of mine said she perfected the boiled egg. And I tried it and it was YUMMO. Bring water to boil, add eggs carefully, I use tongs, turn heat to medium and cover, set the timer for 7 minutes. Take out and put them in a bowl of ice water to stop the cooking. Peel and serve. These are really good. I love how they're still a little runny, but not overly so. I added some tomato-less salsa from Trader Joe's and fried up some organic bacon from Whole Foods. Potatoes are fried in a little coconut oil and still slightly raw in the middle then topped with New Zealand grassfed cheddar cheese. 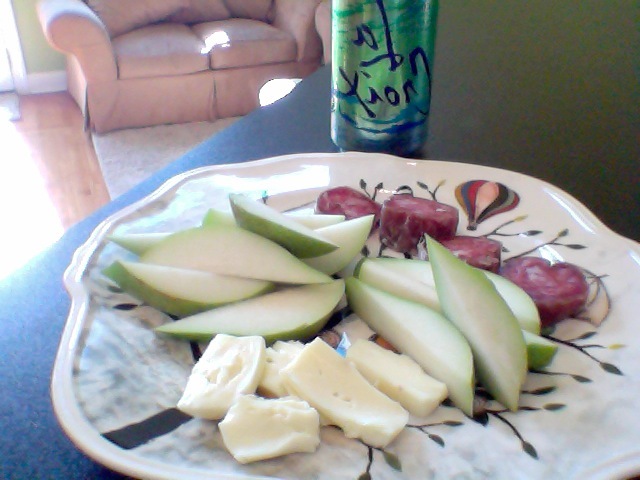 Some brie cheese, a sliced pear and some red wine meat with a naturally flavored carbonated water-La Croix waters have helped me cut out the Coke I would drink daily-I haven't had one in over a month. This is the lime flavored one and you can buy them at Target -they also have grapefruit, coconut and cran-raspberry. They're sold in packs of 8 near the bottles water. Superbowl gave me an excuse to eat wings, not that I really need one. The way I eat I CAN eat wings. These are organic cut chicken wings marinated in 1/4 cup ACV and water to cover for hours, baked in the oven on a dripping rack for about an hour and a half on 375 degrees. When they're done, take them out, put them in a large bowl that has the sauce waiting and cover them in it, serve immediately. 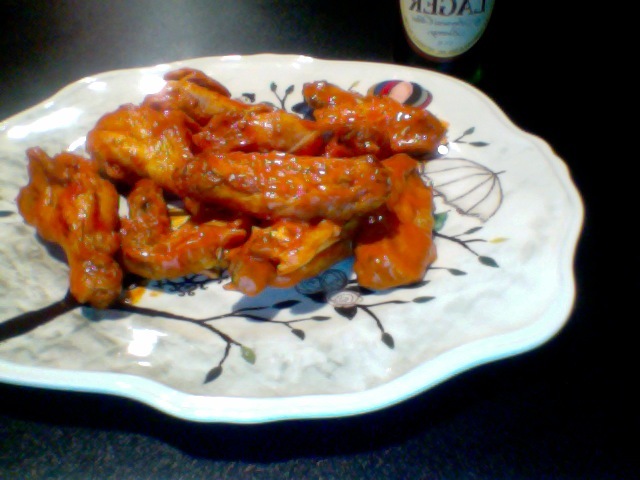 I used a sauce from Whole Foods-it's called Wing TIme. It's our favorite. 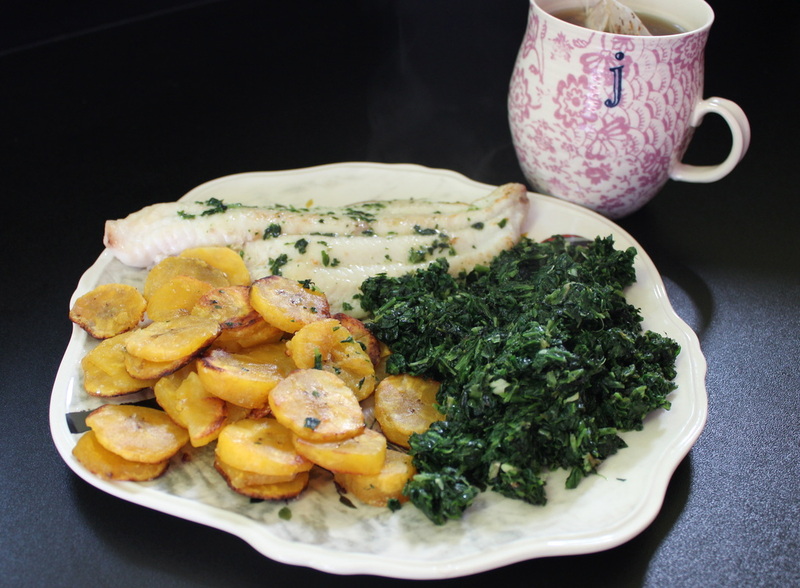 Most of the meals I eat couldn't be simpler. But they're nutrient dense and give you a ton of energy. 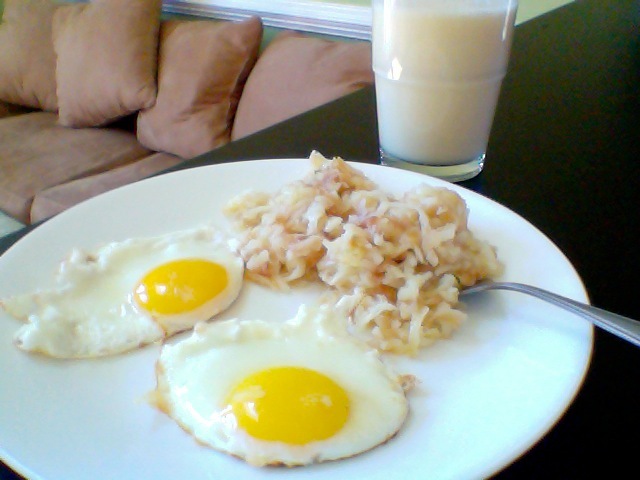 This is just 2 eggs and hashbrowns cooked in coconut oil. Coconut oil is a great oil to cook with and really the only oil I do recommend to cook with along with Real Butter. It has a high heat point and doesn't go rancid for a long time. 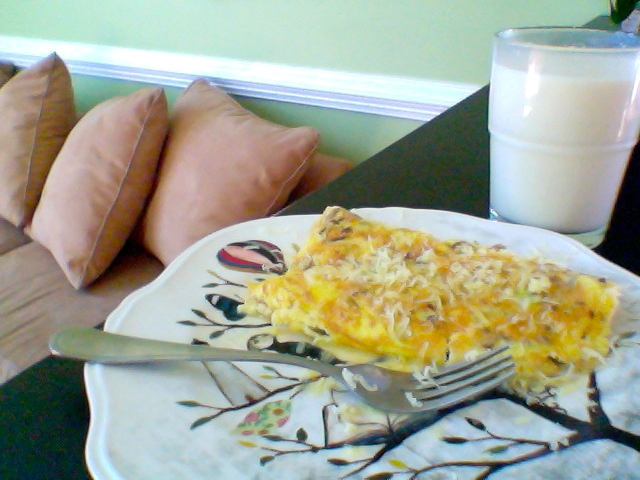 I topped the hashbrowns with New Zealand grassfed cheddar (Whole foods) and my drink is orange juice with 2tbs heavy cream. I can't even tell you how indulgent it tastes, it's like a creamsicle. I add the cream right before I drink it, or else it can curdle. ;) Make it, enjoy it. 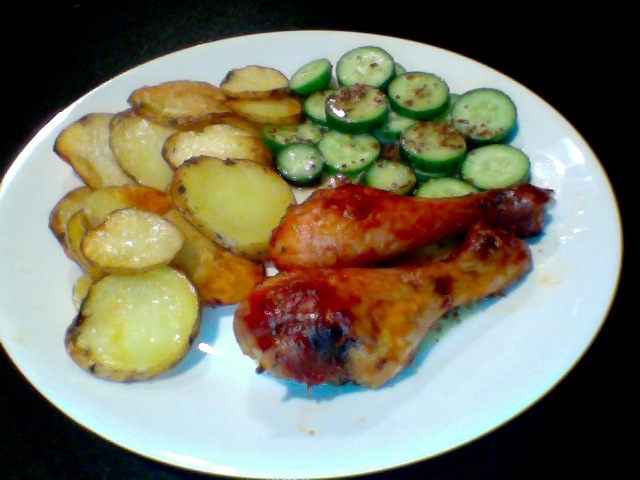 A little bit about how I eat...I eat whole foods and make dishes with little to no preservatives. If I do add a touch of sauce or anything not whole food worthy, it will be noted. I do try and buy organic whenever possible, but if not, it will always be a whole food. 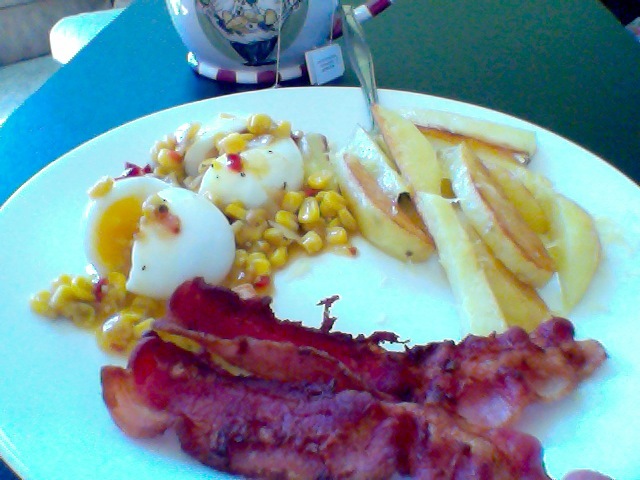 Here you see my breakfast from this morning. 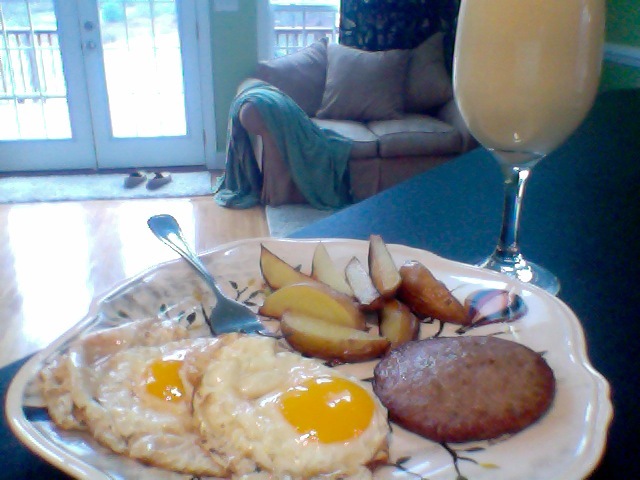 I LOVE making breakfast for myself during the week when I'm basically just cooking for for 1. It's actually very simple: 2 boiled eggs (boil water, add eggs CAREFULLY, I suggest using tongs to lower them into the pot, turn down to medium heat and cover, set timer for 6 minutes 30 seconds and remove and put them in ice water to stop them from cooking. 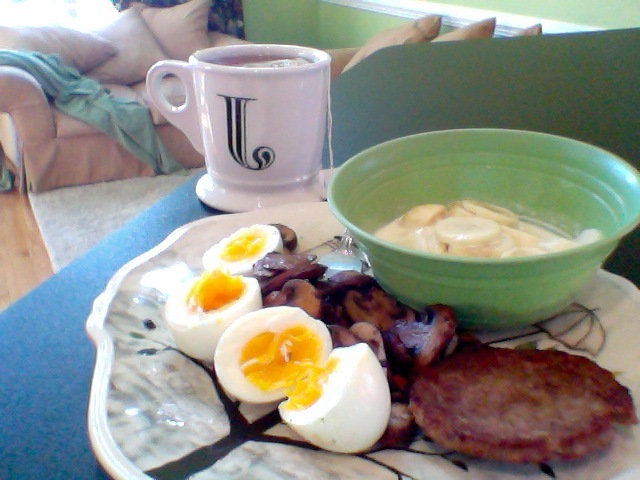 I fried mushrooms in grassfed butter along with a sausage patty and then a side of bananas and 1tbs heavy cream. I always make myself a cup of non-caffeinated herbal tea to top it all off. 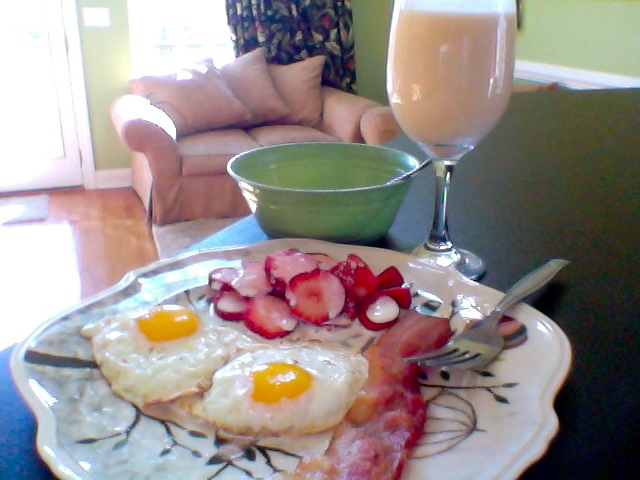 :) Breakfasts like this make me so energized!